Khajur Ki Chutney recipe by Nazia at PakiRecipes.com. 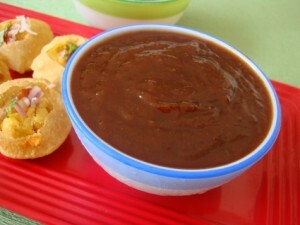 Khajur ki Chutney is sweet and tangy chutney made with tamarind and dates. Put all the ingredients in a blender and mix well. Seive and throw out the residue. Serve the strained chutney with kababs, tikkas.